Looking For The Best Dog Balls for Chewers? Here’s a look at our favorites, including our top pick – IQ Treat Food Dispensing Ball. Just about every dog-owner has been there—you buy a nice ball for your pooch, and the next day you find it ripped to shreds. I grew up with five dogs (ironically, I had more dogs than siblings) and three of the five dogs were big-time chewers. Since dogs don’t exactly respect each other’s property, we had to get durable balls for all five dogs in case one of the chewers got a hold of one of the smaller-dog’s toys. We also had to make sure they had a steady supply of chew-toys so the playful pups didn’t chew on household items (though that was a never-ending battle that we frequently lost). Through trial and error, we finally came to recognize what kinds of balls and toys could last more than a day, and keep their attention away from shoes and electronics. Safety – a product isn’t indestructible just because it says so on the packaging. Be careful when purchasing balls or toys made of plastic, as these can splinter and pose a serious choking or digestive problem. You’ll also want to avoid animal bones that can also splinter and get lodged in their throat. Non-Toxic – you wouldn’t give your baby a rattle coated in lead-based paint, so why would you give your pet a chew toy with harmful chemicals? Check the label on the toys and balls you purchase to make sure they’re made of non-toxic materials. If a piece of the toy ends up splintering off and getting stuck in their digestive system, at least you won’t have to worry about toxic shock or poisoning. Plush and Stuffed – you’ve probably already learned this by now, but plush and stuffed toys and balls won’t last through the night. Not only will they be ripped to shreds, but chances are your dog will unintentionally consume some of the material and cause digestive problems. Avoid plush and stuffed toys as much as possible. Vinyl and Latex – these types of toys are often touted as “indestructible,” but more often than not they fail the test. They also tend to come with squeakers or bells inside, which can unfortunately be swallowed when the toy rips open. Hard Rubber – these toys are as close to indestructible as you’ll get. They’re soft enough to chew on without chipping teeth, but hard enough to last (for a little while, at least). Hard rubber toys often come with grooves and nubs that can also help clean your dog’s teeth, reducing plaque and tartar buildup as they play. Rope – strong, fibrous rope-style toys and balls are another good option. They probably won’t last as long as hard rubber toys, but it’s a good choice to mix it up for your dog. It’s also fun to play tug-of-war with—and what dog doesn’t like that? 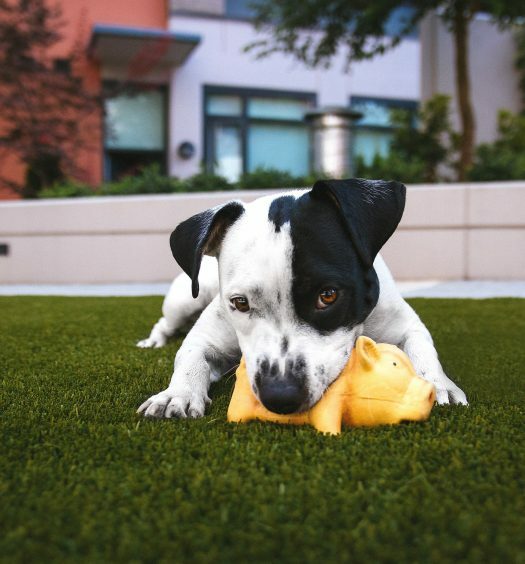 The IQ Treat Food Dispensing ball is the trifecta: it has a hard rubber shell for durability, it doubles as a fun treat-dispenser as your dog plays with the ball, and it promotes healthy teeth and gums. 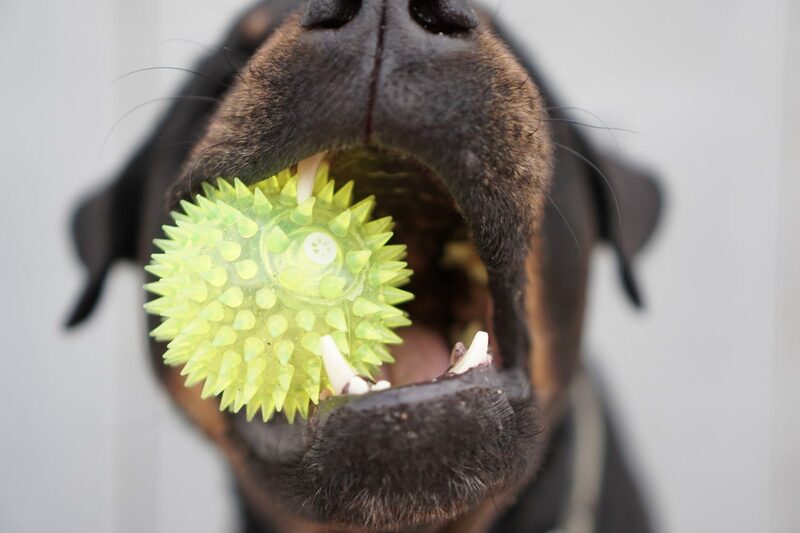 The ball is lined with nubs in a soccer ball style layout, so every time your dog bites, chews, and gnaws, the nubs scrape plaque and tarter from their teeth. It’s soft enough that it won’t chip your dog’s teeth, and the lack of plastic or other harmful materials eliminates the concern for choking hazards or digestive track issues. Inside the rubber shell is a plastic tumbler where you can deposit small treats. 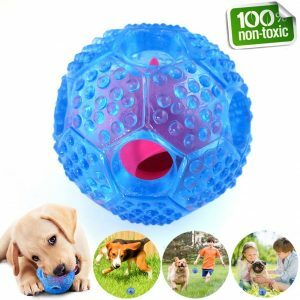 As your dog plays with the ball, the plastic inside-ball will spin, and when its openings line up with the openings on the outer rubber shell, your dog will be rewarded with a treat. 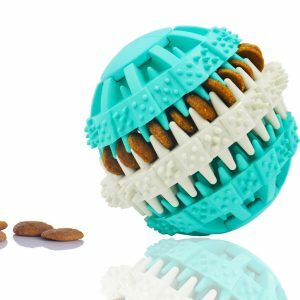 As a bonus, you can purchase doggie dental treats to put inside the ball, so that the healthy treats and the ball itself both promote good dental hygiene. The Rubber Bouncy Dog Ball is a great ball for playing fetch. It’s made of durable rubber and is 100% non-toxic. The all-rubber composition gives it a good bounce when you throw the ball, making fetch much more fun for your dog as it bounces off the ground and walls. The ball also comes with a small brush that you can use to clean the ball when it starts to accumulate saliva. That may be my favorite part, as I have many memories of trying to play fetch while touching the saliva-drenched ball as little as possible. StarMark is a reputable brand in the dog-toy business, so you can rest assured that purchasing one of their products is a good, safe decision. This particular StarMark Treat Dispensing Ball is made of a synthetic material that’s stronger and lighter than natural rubber, and it’s 100% non-toxic. 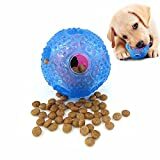 The product has been tested for health and safety, so you don’t need to worry about digestive issues if your dog manages to consume any part of the ball. This ball includes an internal treat-dispenser, adding a measure of mental stimulation as your dog works to release tasty treats. 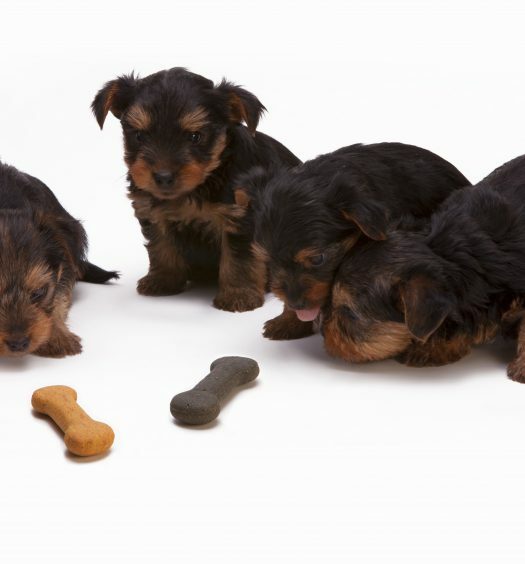 It has grooves on the outside to strengthen and clean their teeth as they chew, and when combined with dental treats, it’s a great way to promote a healthy mouth for your dog. 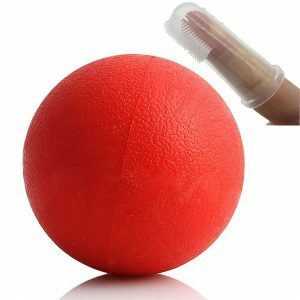 Following the trend of hard-rubber balls with an internal treat dispenser, this Dog Ball by Jiange is another solid option to provide durability, mental stimulation, and dental hygiene. It has a rather unique design that can scrape plaque and tartar better than the average rubber ball, and its’ treat-dispensing mechanism is a bit more consistent than some of the other options in this article. If your priorities are dental hygiene and durability, this is the best choice for your pet. The BIONIC Ball is another unique option for your dog. 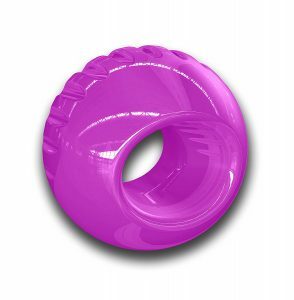 Rather than going with a traditional spherical ball, this product is shaped more like a donut with a hollow core. The style tends to be more durable than a traditional ball, and it’s easier for dogs to chew and play with. Of course it’s made of high-grade rubber, and it’s non-toxic. It’s also a good choice for use around water, as this ball can float in water. 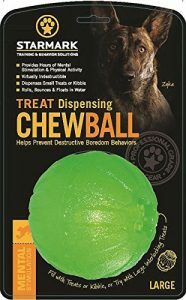 I only recommend reputable products with solid reviews, so you can trust that all of the balls in this list are a great choice for chewers. All of them are highly durable with a rubber shell, they all have grooves or nubs to promote good dental hygiene, and a few of them come with the added benefit of a treat dispenser. No dog toy is indestructible, but these balls will last much longer than your average product.